February 9th, 2014 (5:41 PM). Edited March 22nd, 2016 by LocksmithArmy. Pokemon - Rocket Science version is a hack of Pokemon FireRed version. 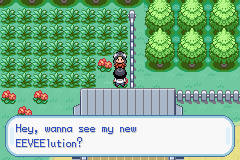 You play as a Team Rocket Scientist on a mission from Giovanni. 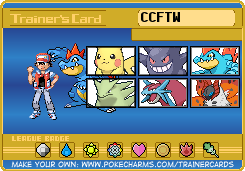 After Giovanni gets defeated at Silph Co. he calls all his spies that were employed by the Silph Co. to a secret meeting in his gym. He gives them all a new mission, to create super powered pokemon, and he gives you the mission of being the "field agent" for the team. You travel around Kanto completing various missions, usually related to the doings of RED (the hero from FireRed version). Go to Mt. Moon to recover the fossil RED did not take. Clean up the mess left over when a fellow Team Rocket Grunt fails to steal TM DIG. 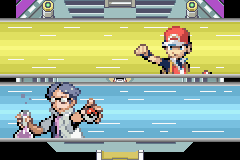 Infiltrate the S.S. Anne at sea and steal HM CUT. Gather Cubone Skulls from Pokemon Tower. Catch all the mystical birds for Team Rocket. Discover just how mewtwo was made and how Team Rocket got the Mew DNA. All while stealing Pokemon for Team Rocket to use or sell at the Rocket Game Corner. 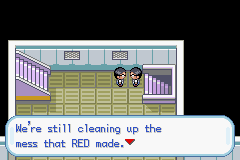 Work your way through the game following RED and all the issues he causes Team Rocket. Finally catch up to him in the Elite Four. This is a finished hack. To play this game all you have to do is follow this link, and play the game right there online, no download or patching required. February 14th, 2014 (8:11 AM). Location: Do you really want to know? Really? My apologies in this thread getting lost. I'll give it a little bump back up right now. February 14th, 2014 (8:43 AM). February 14th, 2014 (10:04 AM). I agree with ElitePokes. Can you please make this downloadable? February 14th, 2014 (10:18 AM). But the hack was made for a contest and one of the rules was that it wouldnt be posted for download anywhere else..
there is a way to download the game from vizzed directly... but please dont upload the rom anywhere else. It might disqualify my hack. February 14th, 2014 (11:53 AM). Can we download the hack after the contest is over? February 14th, 2014 (7:02 PM). Btw, when you steal Pokemon, do you get to use it? February 14th, 2014 (7:08 PM). You cant use them you have to turn them in to ur boss... but its ideal to steal em all. U get good rewards. February 14th, 2014 (8:57 PM). Silly question, but how and when can I use the PKMN Stealer? February 14th, 2014 (9:01 PM). If you use it, it will allow you to steal one pokemon from trainers you have beaten. You can't steal from all trainers, so just try it with each one you defeat. So use it, then talk to the trainer. February 14th, 2014 (9:19 PM). Q: How do I use the PKMN STEALER? A: To use the PKMN STEALER you simply go to your KEY ITEMS POCKET and push (A) when you have the PKMN STEALER selected. Then select USE. You should then see the message "Happy thieving!" and you are now ready to steal a Pokemon. All you have to do is talk to a trainer that has been defeated already and you will attempt to steal their Pokemon. 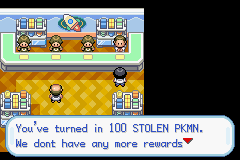 There are 100 STOLEN PKMN items in the game... 100 Trainers can have their Pokemon stolen... get them all and turn them in at the Game Corner rewards desk. The PKMN STEALER works best in darker areas, caves, forests, inside buildings. There are a few exceptions but most STOLEN PKMN items will be gained from those locations. 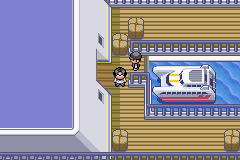 Don't forget to double check all trainers on the S.S. ANNE, because you cannot return to the ship once you leave. It is also advisable to register the PKMN STEALER to (SELECT). Q: When I make a call using the R.C.D., noone answers. Why is this? Q: Where is the Poke Flute? A: After completing the Cubone Skull sidequest, you turn them in at the Rocket Game Corner rewards desk. When you try to turn one in, you will get the "SCREECHER" item. the Screecher is used to wake Snorlax, there is no PokeFlute. Q: Where is the HM STRENGTH? A: It is the reward given to you for being the second person to reach the end of the Safari Zone... RED was the first and got the first place prize of the HM SURF. Q: Where is the HM SURF? A: After getting HM STRENGTH, go to the Safari Zone wardens house and use STRENGTH to move the boulder blocking the pokeball item. The Safari Warden will attack you and after defeating him you can take the HM SURF from the pokeball item. Q: How do I get into the 8th gym? A: After getting the 7th badge (or before) you need to go into the Cinnabar lab and talk to Davideo. He will give you a ticket to the Sevii Islands and instructions to go talk to a guy on 5 island. Head to 5 island and talk to JordanV. complete that quest and after catching all 3 mystical birds, you MUST talk to JordanV again. 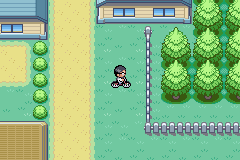 Then the viridian gym will be open. 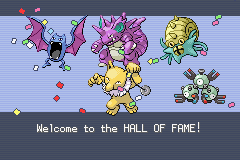 Q How do you evolve the Trade Evolution pokemon (Haunter, Graveler, Kadabra, and Machoke)? A: After completing the Quest on 5 Island, you get a TRANSFERSTONE as a reward. You can use it to evolve any of the trade evolution pokemon. After using the one, you can get another by talking to the machine beside Lizzzz. Q: How do I get Mewtwo? Where do I find Mew? What do I do with this Ditto? A: Train Ditto to lv 35 and show him to one of the scientists in Cinnabar Lab. He will get you a ride to Guyana where you can find Mew. Catch Mew and give some Mew DNA to the same scientist. If you have done all this, after you beat the E4 you will get a call from Davideo who will tell you Mewtwo has escaped from the lab. You can then find him in the cerulean cave. NOTE, You MUST beat the E4 after turning in the Mew DNA. so if you have already beaten the E4, Mewtwo will not appear until after you beat them again. Once you fight Mewtwo, the E4 will be stronger. Q: Do I have to get all the gym badges. A: No, the main story goes until you fight Giovanni. Some Badges are required for HM use. and you cannot fight the E4 until you have all 8 (Giovanni does tell you to go tackle the E4, but that is more like a side quest) Some side quests also require you to beat the E4. February 14th, 2014 (10:31 PM). I would like to say, there is a small bug. DO NOT TALK TO THE WOMEN IN THE ROCKET HIDEOUT EVER AGAIN. After you go to Lavender Town and complete the job, if you talk to her, the script will be partially reset resulting in issues later. February 14th, 2014 (10:43 PM). If anyone playing currently has this glitch PLEASE let me know. February 14th, 2014 (10:51 PM). February 16th, 2014 (2:11 AM). February 16th, 2014 (8:27 AM). This hack is really cool and I'm really enjoying it. I have a question though. Am I able to receive the National Pokédex in this hack, and if so, when do I get it? I really want to evolve my Golbat. "The circumstances of ones' birth are irrelevant. It is what you do with the gift of life that determines who you are." February 16th, 2014 (8:30 AM). February 16th, 2014 (12:17 PM). Aww. No Crobat makes me sad. Anyway, for apparently being under a time limit, this hack is very impressive. Especially the stealing part. I never knew that could be coded into a Pokemon game. One thing that slightly annoys me is the fact that you have to hand in the Stolen Pokemon one at a time. Its just seems tedious to me. But other than that, its a pretty solid hack and you definitely have my vote. February 16th, 2014 (12:20 PM). February 20th, 2014 (7:39 AM). February 21st, 2014 (12:08 PM). February 25th, 2014 (10:21 AM). Playing on vizzed is (more or less, there's actually another way...)the actual way to play it. It has advantages though, you should give it( and mine xD) a try. February 27th, 2014 (12:46 PM). Looks interesting. Finally, there's a completed GBA hack that lets you play as the bad guys! I'll give this one a shot on my 3DS. Yes, my 3DS. I figured out how to download it for my own personal use. Can't share the method for obvious reasons but what I can say is that it's really easy if you know how. Credit goes to Team Brushfire for the awesome banner! February 28th, 2014 (4:30 PM). March 13th, 2014 (10:31 PM).